Science meets Martian art in a new exhibition celebrating 10 years of Mars exploration by NASA's twin rovers Spirit and Opportuntiy. The "Spirit and Opportunity: 10 Years Roving Across Mars" gallery at the Smithsonian Institution's National Air and Space Museum in Washington, D.C., puts otherworldly images captured by the Spirit and Opportunity rovers (the Mars Exploration Rovers) on vivid display as artwork. SPACE.com visited the exhibit this month as NASA celebrated the 10th anniversary of the rovers' 2004 landing on Mars. "It's an art gallery," Grant told SPACE.com. "In an art gallery, you don't look at one [image] and want two others crowding your view. That really constrained the selection because then the number became quite small, but it also put us in a position to work to make sure that the ones we did pick were the ones that not only portrayed Mars and the two landing sites, but best told the stories of the two rovers." The photos selected for the show give a Martian feel to the gallery. Images of red rocks and Red Planet mountains are scattered throughout the exhibit, and the Martian sunrise image is a prominent feature of the art space. The Smithsonian chose the 50 photos used in the exhibit through a whittling-down process. 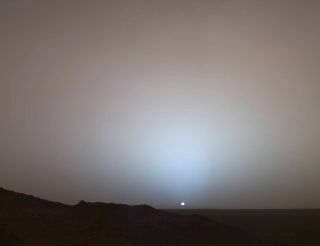 Grant asked the science teams working with the rovers to send in their favorite photos from the last 10 years on Mars. "There are hundreds of thousands of photos, so I put a call out to the science team and said, 'Send us your favorite candidates,'" Grant said. "We got a couple hundred and there was a lot of commonality ... There were some clear candidates in terms of favorites." After picking out some of the favorites, Grant got together with John Callas, Mars Exploration Rover project manager from NASA's Jet Propulsion Laboratory, and Steven Squyres, Opportunity's lead scientist at Cornell University, to select the rest of the images. Grant, Squyres and Callas sat down to talk about not only the aesthetics of the images but their scientific basis "to make sure that we weren't just putting a pretty picture up, but that it also told some of the story of the mission," Grant said. Spirit made its Martian landing on Jan. 3, 2004, and Opportunity touched down on the Red Planet three weeks later. The rovers were scheduled to roam Mars for 90 days, but kept roaming long past that date. Spirit ended communications with Earth in 2010 after it got caught in soft sand. The robot was deemed dead a year later, but Opportunity's mission is still going. The golf cart-size rover is studying rocks along the rim of Mars' 14-mile-wide (22 kilometers) Endeavour Crater.